, descended from a family originally of Nanci in Lorraine, but long established at Paris, was born in the latter city in 1653. From his earliest years, he discovered a taste for architecture, and studying the art with eagerness, soon made very considerable progress. 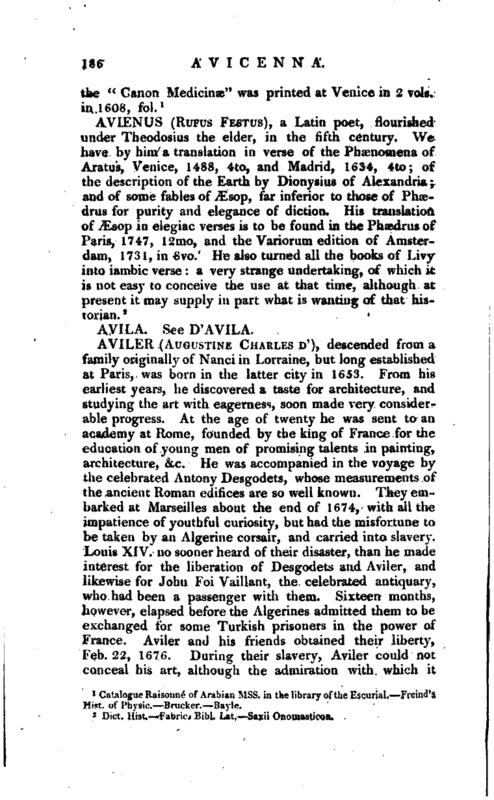 At the age of twenty he was sent to an academy at Rome, founded by the king of France for the education of young men of promising talents in painting, architecture, &c. He was accompanied in the voyage by the celebrated Antony Desgodets, whose measurements of the ancient Roman edifices are so well known. They embarked at Marseilles about the end of 1674, with all the impatience of youthful curiosity, but had the misfortune to be taken by an Algerine corsair, and carried into slavery. Louis XIV. 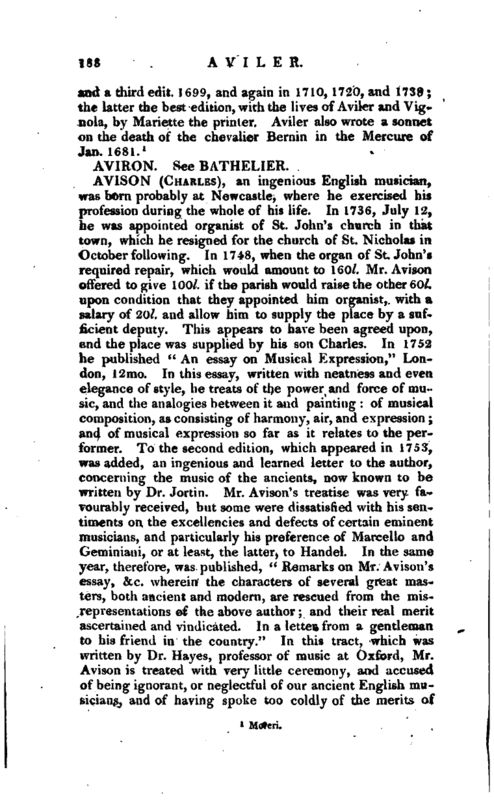 no sooner heard of their disaster, than he made interest for the liberation of Desgodets and A viler, and likewise for John Foi Vaillant, the celebrated antiquary, who had been a passenger with them. Sixteen months, however, elapsed before the Algerines admitted them to be exchanged for some Turkish prisoners in the power of France. Aviler and his friends obtained their liberty, Feb. 22, 1676. During their slavery, Aviler could not conceal his art, although the admiration with which it | struck the Algerines, might have afforded them a pretext for detaining one who could be so useful to them. On the contrary, he solicited employment, and had it at least there was extant some time ago, an original plan and elevation of a mosque which he made, and which was built accordingly at Tunis. On being released, however, he went to Rome, where he studied for five years with uninterrupted assiduity, and on his return to France was appointed by M. Mansart, first royal architect, to a considerable place in the board of architecture. While in this situation, iie began to collect materials for a complete course of architectural studies. His first design was to reprint an edition of Vignola, with corrections but perceiving that the explanations of the plates in that work were too short, he began to add to them remarks and illustrations in the form of commentary and, what has long rendered his work valuable, he added a complete series, in alphabetical order, of architectural definitions, which embrace every branch, direct or collateral, of the art, and which have been copied into all the subsequent French dictionaries. He prefixed also a translation of Scamozzi’s sixth book, which treats of the orders. 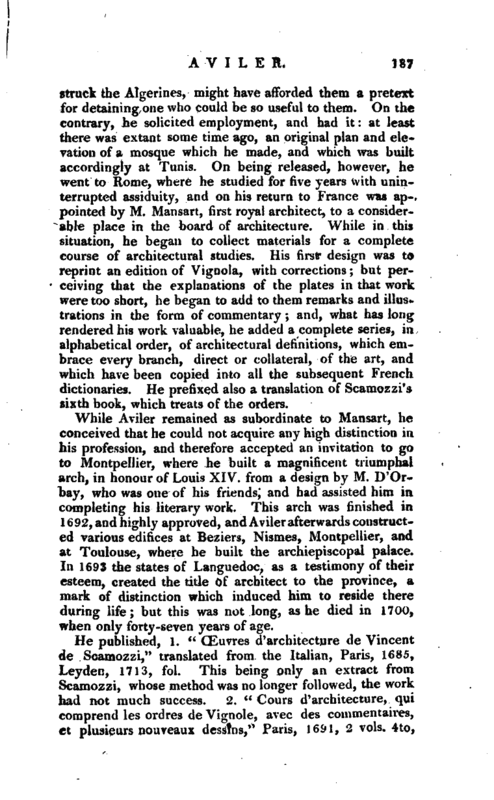 While Aviler remained as subordinate to Mansart, "he conceived that he could not acquire any high distinction in his profession, and therefore accepted an invitation to go to Montpeliier, where he built a magnificent triumphal arch, in honour of Louis XIV. from a design by M. D’Orbay, who was one of his friends, and had assisted him in completing his literary work. This arch was finished in 1692, and highly approved, and A viler afterwards constructed various edifices at Beziers, Nismes, Montpeliier, and at Toulouse, where he built the archiepiscopal palace. In 1693 the states of Languedoc, as a testimony of their esteem, created the title of architect to the province, a mark of distinction which induced him to reside there during life; but this was not long, as he died in -1700, when only forty-seven years of age.